Lighting The Seeds™ — Results so far . . .
To grow plants indoors for the plant sync, we had about 150 fluorescent lamps in 75 corded “shop-light” fixtures. Our setup is simply a larger version of what many home gardeners use for germinating seeds or growing indoor plants. Our use of lighting has a substantial cost and carbon footprint, so we are always on the lookout for cheaper and more efficient lighting solutions. For several years, we have had our eye on LED technology, which is rapidly replacing other light sources for many applications. But LED solutions for our plant-based needs were cost-prohibitive, confusing, and not readily available — until about 2015. Shoplight LED fixtures and LED replacement lamps are now available at most big box stores and online. As of August 2018, standard 48″ fixtures with integrated lamps cost about $20-35 in Central Iowa, USA. Replacement lamps now cost about $5.00 each. The upfront cost remains higher than fluorescent fixtures and lamps. However, the LED fixtures use less energy than equivalent fluorescent products and the lamps usually last longer. The question is: do they work adequately for hobbyist seed starting? There are many scientific studies in reputable academic journals regarding the comparative performance of various light sources for horticulture. However, these studies generally use relatively expensive LED products with exacting specifications for commercial applications. We purchased some standard 48″ LED shoplight fixtures and used a Kill a Watt® meter to measure the actual watts compared to our existing 48″ fluorescent fixtures outfitted with two new 32W lamps. The LED fixtures provided about a 25-30% savings in energy use compared to fluorescent fixtures. The fluorescent shoplight fixtures used 56W and the LED shoplight fixtures used 41W. (For the fluorescent fixtures two 32W lamps do not = 64W because of a “ballast factor.” The LED fixtures have no ballast). See also Light measurements. Then we wondered: Can one just use an inexpensive LED shoplight fixture from a big box store to start tomato seedlings (e.g.)? As of January 3, 2017 we have successfully used shoplight LED fixtures (not an advertisement) for weekly seed starting in our Heuchera breeding program for 14 months. Heuchera seeds germinate (pictured) in the same time frame and at the same frequency as with my previous experience with fluorescent lamps. Early seedling growth is also at least as good as our experience with fluorescent lamps. To back up this anecdotal experience with a little data, we also did a small experiment with kale seeds. We happened to have some Heirloom Kale Mixture seed from Seed Savers Exchange. Two pots containing 20 seeds each in a soilless potting mix were placed at a distance of 5 cm under either LED or fluorescent lamps. The LED treatment was supplied by a fixture with LED “chips” purchased from Sam’s Club (specifications; not an endorsement). The fluorescent treatment was supplied in a standard fluorescent fixture with two new T8 6500K lamps (cool white). For both treatments 18/20 (90%) seeds germinated within one week of sowing (pictured). The appearance and vigor of the seedlings was roughly similar. If anything, the seedlings under LED lamps were more vigorous. The LED treatment is on the right in this picture. Seedlings of kale one week after sowing under two light regimes. Fluorescent treatment is on left; LED treatment on right. 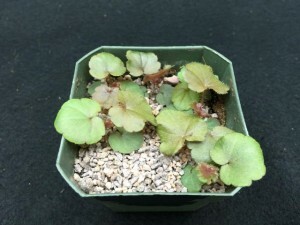 Seedlings were thinned and four individuals from each light treatment were transplanted in 4.5″ pots. The picture below was taken 26d after sowing seed. 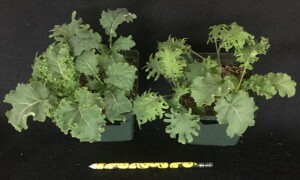 On the left are kale seedlings grown under LED light. On the right are kale seedlings grown under fluorescent lights.